Call us today at 817.581.6936 for a free quote on your new lighting design for your home! Exterior lighting design is the art of painting exteriors with light. Creative Nightscapes can increase the value of your home by adding a new dimension to your property with our professional outdoor landscape lighting design. Whatever the weather, quality outdoor lighting and LED exterior lighting will provide beauty, warmth, and security to your home. 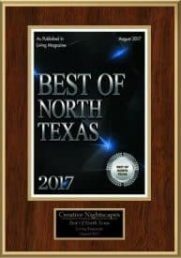 We are the #1 choice for professional exterior landscape lighting design in Dallas-Fort Worth Texas and surrounding areas. We are an exterior lighting company and have serviced over 4000 homes in the Dallas and Fort Worth area. We have over 14 years experience in exterior lighting in the Dallas and Fort Worth metroplex and can answer all your questions before, during and after the installation process. Our exterior lighting solutions provide beauty and security to your grounds and property. Call us for a free estimate in Dallas, Fort Worth and the surrounding areas.